Is it possible to envisage the world from a different spatial and geographical perspective? 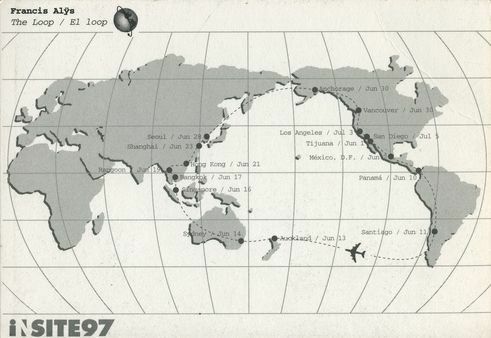 A number of artists have created their own maps using a wide variety of methods: places that emerge through sounds, countries without borders, or fictional cartographies. The Cuban-born Italian author Italo Calvino investigated the idea of (im)possible fictional places in his novel Invisible Cities, recounting imaginary encounters between the Mongolian Emperor Kublai Khan and the Venetian merchant and traveller Marco Polo. The central element here is not so much the exchange between the Western and Eastern worlds as Polo’s travel diary, which connects the two men through memories, emotions and signs. Artists also explore the topic of geography from various angles and create their own spaces: expanses that can only be perceived through memories or sounds, or places without borders. Others strive to throw light on the issue of crossing borders. They hunt for traces, amass collections or create archives from which “artist atlases” emerge – fictional spaces and cartographies, which either reject or question the rules imposed by governments. The Berlin-based Canadian artist duo Janet Cardiff and George Bures Miller fashions spaces using complex sound installations. Their work first gained recognition in the nineties with their extensive “Walks” project, which created spatial experiences through the medium of the voice. The viewers follow spoken instructions, generating ephemeral spaces through their performative participation in the works. It is precisely the act of “wandering through” Cardiff and Bures Miller’s works that allows these open spaces to emerge. They are thus borderless and changeable places, which take on a different form each time through the blurred and shifting perception of the beholder. Belgian artist Francis Alÿs is in his element as a traveller and particularly a flâneur. Many of his works have emerged during strolls through Mexico City, where he has lived since 1986. Travelling from Mexico to the US without crossing the border would seem to be an impossible feat. 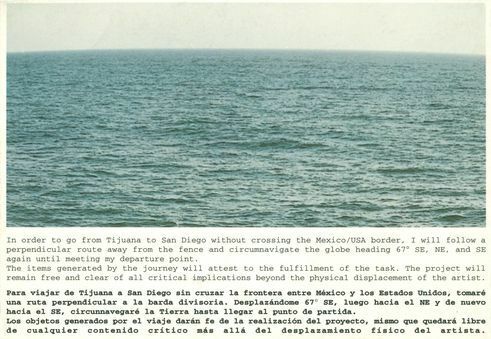 In Loop (1997) Alÿs documented the flights he had to take to get to San Diego (US) from Tijuana (Mexico) without crossing the border between the two countries. Francis Alÿs | The Loop (1997) | Graphic documentation of an action, Tijuana to San Diego | Photo: Courtesy of the artist and Galerie Peter Kilchmann, Zurich Using his fee for an exhibition in San Diego, he travelled via Tijuana to Mexico City, Santiago, Auckland, Sydney, Singapore, Bangkok, Rangoon, Hong Kong, Shanghai, Seoul, Anchorage, Vancouver and Los Angeles, finally arriving in San Diego. His odyssey threw light on the absurdity of national borders and border controls. "The most international artist in the universe"
Whether to escape war or for economic, ideological or religious reasons, many people over the centuries have been forced to leave their homes and migrate. Borders are a central theme of the work of Brisbane-based Indonesian artist Tintin Wulia. In 2007 she started collecting copies of passports – both from existing countries and from lands that have disappeared, such as the German Democratic Republic or Yugoslavia. Her collection currently numbers 154 passports from various nations, which she integrates into her installations, performances, workshops and videos. 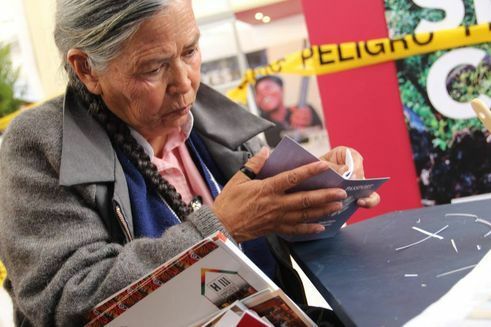 Tintin Wulia 2014 | Make Your Own Passport | Installation and Workshop-performance at World Stage, Habitat III UN Conference, Quito (2016) | Photo: courtesy of the artist and Next City Wulia calls herself “the most international artist in the universe” and invites visitors to create their own passports in her installation and workshop-performance Make Your Own Passport (2014). In a kind of lucky dip, each participant is allocated a passport, sparking conversation about various topics, such as migration, nationality, family destinies or personal stories. Those who have been assigned the status of “stateless” listen to fictional or real accounts about a person who has no nationality. Wulia’s work gives a real and relatable face to the power of documents and the arbitrary nature of concepts of exclusion, such as nationalities or nation states. Moheda (1966-2016) is a project by Berlin-based Uruguayan-Swedish artist Juan Pedro Fabra Guemberena. In 1979, at the age of seven, he left Uruguay and went into exile to Sweden. 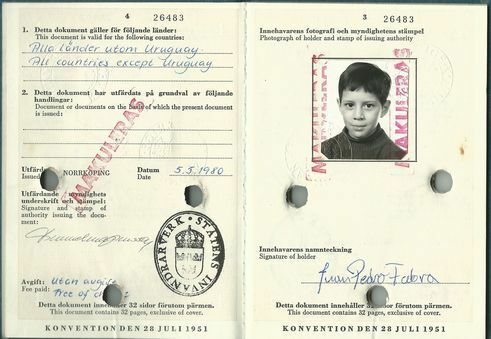 His passport was stamped “all countries except Uruguay”, meaning he could no longer visit his homeland. Moheda is the place where he lived as a refugee with children from other countries. This “contemporary ruin”, as the artist calls it, was built in 1966 and dismantled in 1990. It was the first settlement built for guest workers, who primarily came from the former Yugoslavia and Greece. Juan Pedro Fabra Guemberena | Moheda (1966-2016) | Photo: Courtesy Juan Pedro Fabra Guemberena Fabra Guemberena’s project began in winter 2015 when he heard a radio programme featuring refugees from Syria. 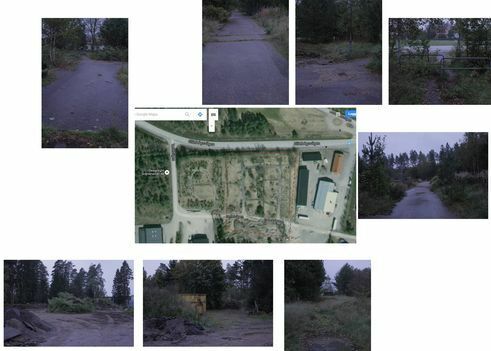 The interviewees insisted that their temporary accommodation – five kilometres away from Moheda – was haunted by ghosts. This got the artist thinking about memories from his childhood. With Moheda, Fabra Guemberena has crafted an “emotional archaeology” which reconstructs this settlement using memories and fictional stories. Juan Pedro Fabra Guemberena | Moheda (1966-2016) | Photo: Courtesy Juan Pedro Fabra Guemberena His work strives to transform this place into a Swedish historical memorial. And to ensure that his findings have a solid scientific and legal foundation, he is cooperating with an archaeologist and a lawyer. Fabra Guemberena aims to do more than merely observe the refugees from an external perspective: he wants to discover the many different facets of their lives and explore their dreams, thus giving them a voice. Borders form barriers between people and negate space for dialogue. Just as Marco Polo enthusiastically regaled Kublai Khan with tales of possible cities, these artists have constructed imaginary geographies which bring home the artificial nature of the concepts of nations and borders. In turn, this can be viewed as a plea to question these ideas with the aim of fostering dialogue with others. Copyright: Copyright Text: Goethe-Institut, Katerina Valdivia Bruch. This work is licensed under a Creative Commons Attribution – Share Alike 3.0 Germany license.